Martin Luther King Jr. Memorial Library (MLKML): This building is rare among Rohe’s architectural accomplishments because it is not only the sole library he ever designed, but it is a rare example of modern architecture in Washington, D.C. Unfortunately, for those who wish to tour it, it is closed for updates until the year 2020. The Barcelona Pavilion: This building was used for the official opening of the 1929 International Exposition in Barcelona, Spain. It stands out in term of design because although it is minimalistic, as all of Rohe’s works are, it effectively uses fanciful materials such as marble, red onyx and travertine. Villa Tugendhat: An icon of modernism, this building is located in Brno, Czech Republic and is one of the oldest structures reflective of European modernism. So, as you can see Rohe’s talents were unbounded by a single field. He excelled in his furniture designs particularly with his Barcelona chair. 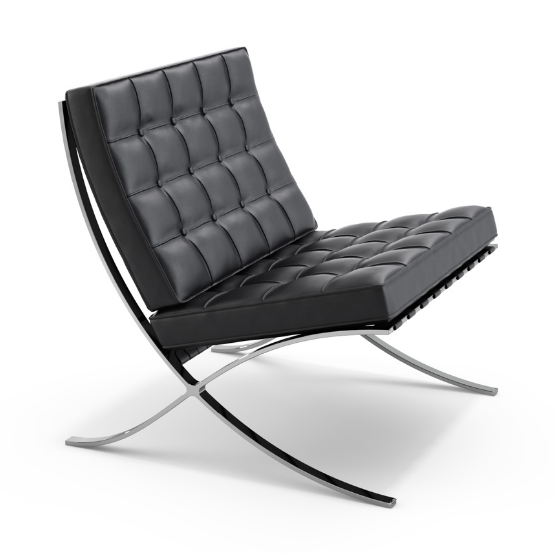 Rohe also designed day beds, sofa, tables and chaise as well as other furnishings in the modernist style. His achievements in architecture also reflect his enormous talent. Most of his architectural works stand to this day and have become icons in the modernist design movement.